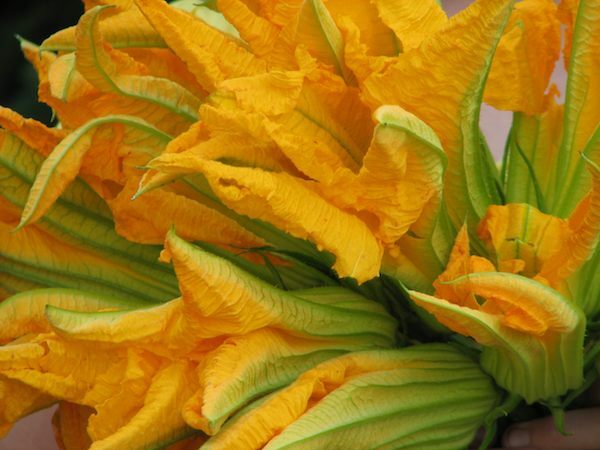 Zucchini and pumpkin flowers are wide open early in the morning, and they close up as the sun gets higher in the sky. Insects love to crawl in the blossoms, we pick them when they're open so we can peak in and make sure there are no bugs hiding inside! Picking at dawn also lets us avoid the bees, who just love our blossoms. Our flowers are picked to order, so please call us at least a day before you need them! The key is freshness, and knowing what time of day they were picked. Just like regular cut flowers, keep them in a vase with water! Lots of our customers stuff them, but we don't have a recipe, please help us! This Mexican classic, is as simple as adding the flowers to the cheese when you make your quesedillas.